Admission: Tax-deductible charitable donation requested in the minimum sum of $15.00 per participant at the door (check or cash). Description: "An Evening with the Artist Who Loves Fitness"
Come join me for my ABSOLUTE CHARISMATIC ARTIST ZUMBA® CRAZE Cardio Dance Routine and take a photo with my 18" x 24" pencil art portrait of Zumba® founder, Mr. Beto Perez! 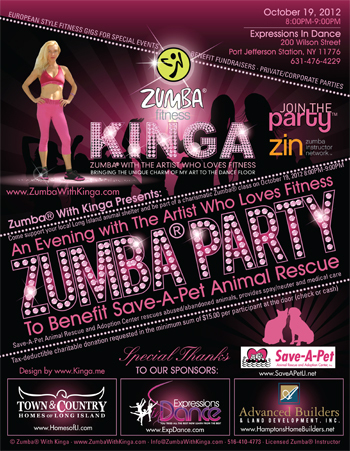 Zumba® with Kinga Presents: An Evening with the Artist Who Loves Fitness at Expressions In Dance to Benefit Save-A-Pet Animal Rescue and Adoption Center. Come support your local Long Island animal shelter and be part of a charismatic Zumba® class on October 19, 2012 8:00PM-9:00PM at Expressions In Dance. Tax-deductible charitable donation requested in the minimum sum of $15.00 per participant at the door (check or cash).